Later this week, I'm going to discuss some subtle differences between older Millennials and younger Millennials, but one very obvious difference is the ones that try to call themselves Xennials have memories from the 80s. And you know what? The 80s were great - and the cinema was better. In thinking of this list of ten movies, I decided early on that I was ruling out all and any sequels. Otherwise, half the list could be Ghostbusters and Back to the Future. Which, spoilers, those movies are definitely on the list. Then I decided to include movies that I enjoyed as a child and as an adult - which means I had to rule out The Breakfast Club because I didn't see it until I was 24. 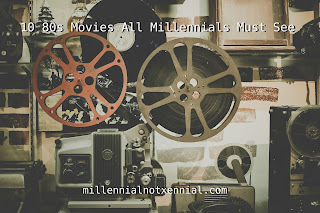 Without further ado, here are ten movies that all Millennials must see. We had a thing for time travel in the 80s, didn't we? Bill and Ted's Excellent Adventure is fun romp where the sole motivation is getting two San Dimas teens to pass their history class. I love seeing these two airheads try to understand how time travel works to help themselves - and it turns out, the future of the world. Wyld Stallyns rule! Ferris Bueller is the ultimate cool. I only skipped school once in my life, and my ride to the mall got arrested - I certainly didn't get to be in a parade! But serial skipper Ferris Bueller sure knew how to make the most out of life, and he was only 17 years old. Plus, there's a cameo by 80s Charlie Sheen, and I'm never mad at that. I really related to Ariel as a child, sure I didn't fit in where I was and believing there was something more for me out there in the world. Of course, The Little Mermaid taught me a few lessons. First of all, I learned that if someone evil tells you they're not evil, it's okay to not trust that. I also learned that family usually has your best interest at heart, even if it doesn't seem like it. The Little Mermaid is one of my favorite Disney films of all time. All Dogs Go To Heaven utterly destroys me. I don't watch it as often as I should because I hate crying, but it would be very disappointing if a movie with Heaven in the title wasn't a movie about redemption, and it definitely delivers on that. It's a movie for the whole family to enjoy together. I am obsessed with Little Shop of Horrors. It is one of my favorite musicals of all time. It's boy meets girl, girl has evil boyfriend, boy meets plant, and plant murders world - that classic story. This particular version of LSoH loses the morality tale of it all, but it has Steve Martin as a sadistic dentist and Bill Murray as a masochistic patient and that's amazing. From here on out, my obsession with the movies only intensifies. Heathers is a fun, quotable dark comedy with a ton of homicide. We all know that high school is the worst, but at least it wasn't as bad as it was for Veronica Sawyer. It's not fun being an accomplice to murder because your boyfriend is a psychopath. This is one movie where I'm glad it's nothing like the source material, even though I did enjoy the book. The book just wasn't a 1940s detective movie where the true villain was right under your nose the whole time. Plus, there weren't as many well known 1940s cartoon icons in the book! Fun fact: Between 1989 and 2009, I only watched Roger Rabbit while I was sick and high off of cough syrup, and the movie is totally different when you're not exactly sober. I know John Mulaney has a whole bit about how weird Back to the Future is, but it is actually one of the most perfect movies of all time. I learned this when I rewatched the movie while I was in a screenwriting class. The movie is textbook, without being so formulaic and predictable that it's boring. It's just a shame that DeLoreans had to wait 20 years for the movie's most devoted audience to be old enough to actually purchase one. Also, Marty's mom is kind of creepy. My mom tells people I had a crush on Beetlejuice when I was a little kid, and I can't say that she was wrong. I did build many a blanket fort where I pretended to hang out with the ghost with the most. I also am really, really mad that Lydia reneged on her promise. I watch Beetlejuice at least 20 times a year, and it only gets better every time I see it. Fun fact: I was really pissed it was super obvious that Alec Baldwin and Michael Keaton did not actually share a single scene in the 100th episode of "30 Rock." Ghostbusters isn't just my favorite movie - it's my favorite franchise. Everyone has a favorite Ghostbuster, and while most people's are Venkman, I've always had a soft spot for Egon. Egon made the tech - they couldn't bust ghosts if it wasn't for him. I also just really like that it's an inspiring story about three friends who lose their job and risk everything to into business for themselves. Even as I made the list, I knew there were movies I was leaving out. Where's The Land Before Time? What other movies should I have included on this list? Let me know in the comments.